FRIDAY POST ~ Hope you enjoy the sample of our Sketchbook Project 2013 and our haiga, which is essentially a photo or painting with a haiku. My creative spirit was being nourished again today by our walk on two beaches. While I was walking and collecting small beach rocks to paint on for friends, ArtMuse Dog was running and exploring other delights of nature's treasures on the beaches. Wishing you a wonderful and fun weekend. I really like the idea of your sketchbook, and your Haiga is beautiful. Have a great weekend. 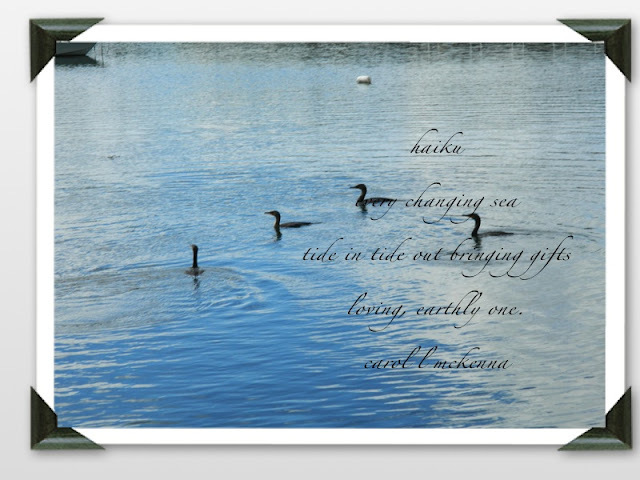 Love the haiku on the photo- such a fabulous way to do it! A beautiful shot and Haiku - lovely! Sketchbook looking good. I love the haiku over the ducks photo. Two beaches? I am doubly jealous today. I loved sharing your sketchbook.... and haiku. HI Carol..what a beautiful post..love the sketchbook.. it is looking fabulous and divine..very special! and your poetry and photo is magnificent! Shine on..spectacular magic here always! Beautiful haiku and the pic. 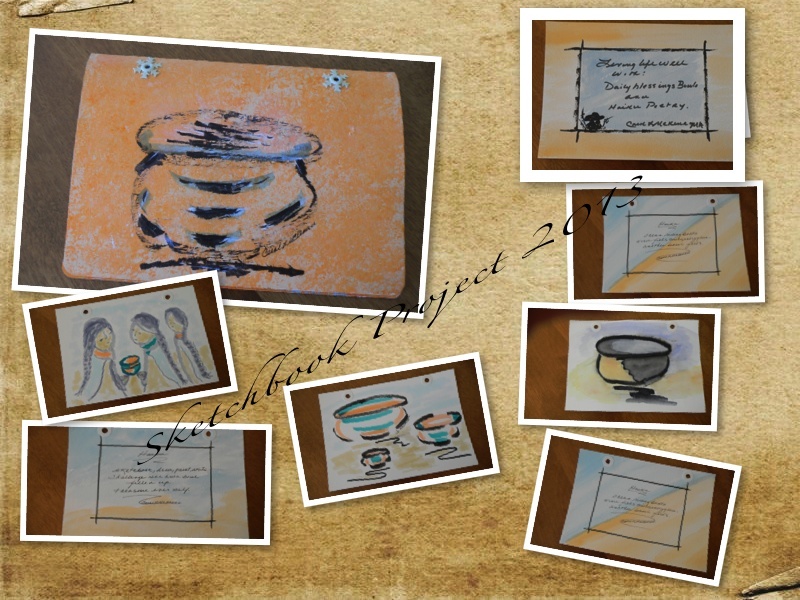 Your Sketchbook Project 2013 looks amazing! I love the Haiku on your peaceful photograph. Separately they are wonderful; combine it is truly special. Have a wonderful weekend. I love the swirls of your pots in the sketchbook. Deeds do speak for themselves! Your sketchbook project turned out really nice, Carol. Wouldn't it be wonderful if we would all follow the thought expressed in your Confucius quote? What lovely gifts and lovely haiku! Your sketches are coming along beautifully!! I'm sure the book will be wonderful! I love the idea of the haiga. The Haiku on the picture. I also love your bowl p[ictures. Tiny portraits, every one of them. A great project overall. So lovely Carol, it made me want to walk the beach as well! I love the idea of photos and haiku becoming one... hugs to you! Fantastic post, Carol! Your drawing is fantastic and the haiku is wonderful! This is such a gorgeous blending of poetry and imagery. I really like your sketches today! The poem and picture are so peaceful! Hi Carol and artmuse. Hope you are both doing great after your walk. Love your 2013 journal page and Haiku. Thanks for sharing. Have a great weekend. your sketchbook pages go so well together, harmonious in colour, nice job! This is a beautiful postcard which we seldom post nowadays. love, love, love how your sketchbook project pages are coming together! Love the soft colors on your sketchbook pages. Happy PPF! Enjoyed your haiku and pic. Lovely. Many tides have come and gone since your sweet haiku and art have graced my screen, each one bringing peace and light. Really like your sketchbook pages. I think my favorite is the piece at the top left...nice! Love the Haiku! I love being out in nature as well, I find it so inspiring! Kudos for your sketchbook project. thanks for placing me so warmly in your pocket and sharing wistful walks on the beach. it is wonderful to watch your sketch book project grow in beauty with the perfect marriage of your charming blessing bowls and lovely haiku! everything here is so lovely, wonderful! May the tides continue to bring you gifts daily! I’m late making the rounds from Haiku My Heart Friday. Apologies! Sorry for being so late on this 'haiku round'... but now I have time to stop and take the time to really look and read. I LOVE your pages for the scrapbook project! You photo has that Autumn-feel - love it!